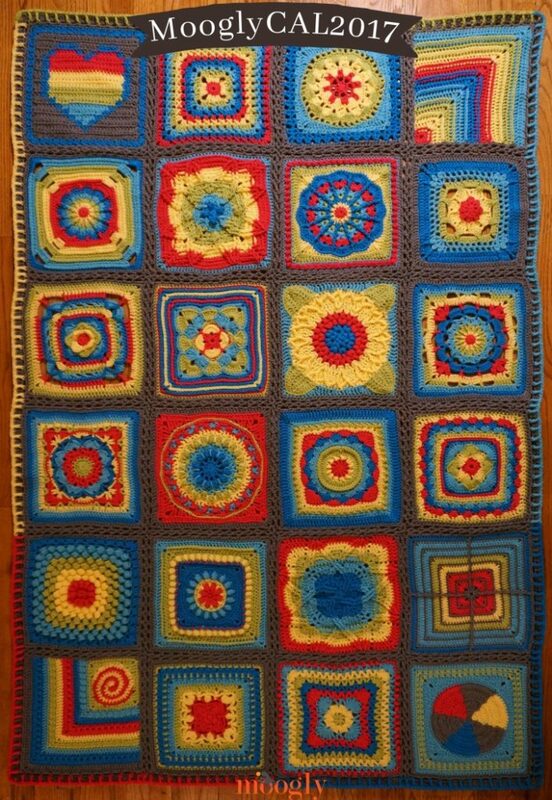 Every year, as I finish up my Moogly Crochet Along blanket, I like to come up with a new border to finish it off. This year, it’s the Windows Border! 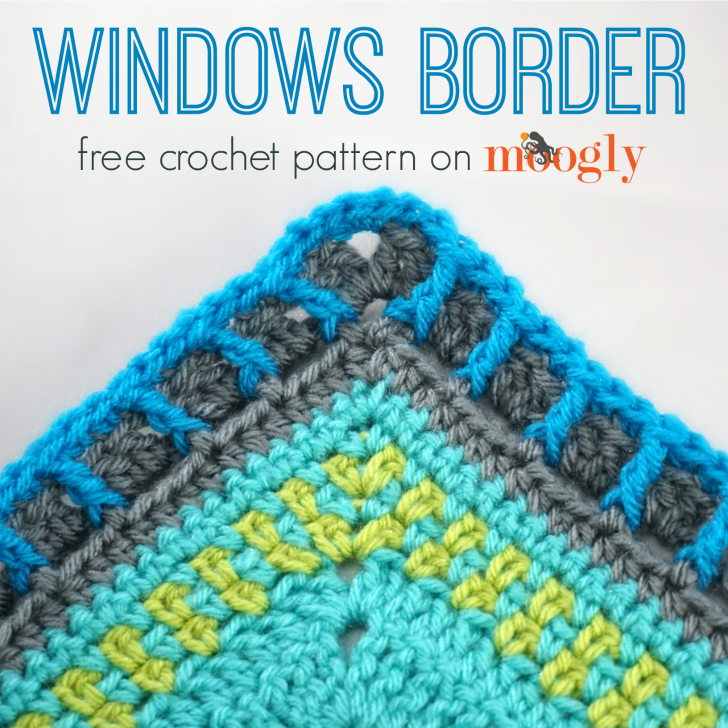 The Windows Border is an easy two round pattern that can work with just about any pattern, but it is particularly suited when you’re bordering squares or blocks that have been joined by one of the “loopy” methods, where chain loops are made all the way around the square. This would include the Tight Braid Join, Scallop Join, Flat Braid Join, and more! And I think it looks like little windows with pretty curtains – but the modern, graphic style will work with tons of patterns! 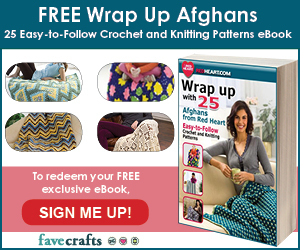 Use whatever hook and yarn go with the item you are adding the border to. 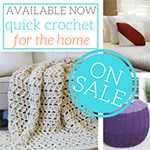 Yardage will vary with the size of your project and yarn/hook used. Rnd 1: Work 2 dc into each ch loop; ch 1 and skip the sc sts; join and break yarn. At the corners: Work (2 dc, ch 2, 2dc) in each corner ch loop. Round 2: Work a blo sc in each dc st; fptr in each skipped st of Project Row (before Border Round 1), working in front of the ch-1 in Rnd 1; join and break yarn. Rnd 1: *Dc in the next 2 sts, ch 1, skip the next st; rep across, join and break yarn. At the corners: Work (2 dc, ch 2, 2dc) in each corner st or sp. Row 1: Dc in the first st, ch 1, skip the next st, *dc in the next 2 sts, ch 1, skip the next st; rep from * across until 1 st rem, dc in the last st; break yarn, do not turn. 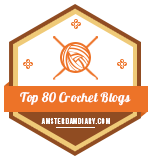 Row 2: Join with sc in first st, fptr in skipped st of Project Row (before Border Row 1), working in front of the ch-1 in Row 1, *blo sc in the next 2 sts, fptr in skipped st of Project Row (before Border Row 1); join and break yarn. 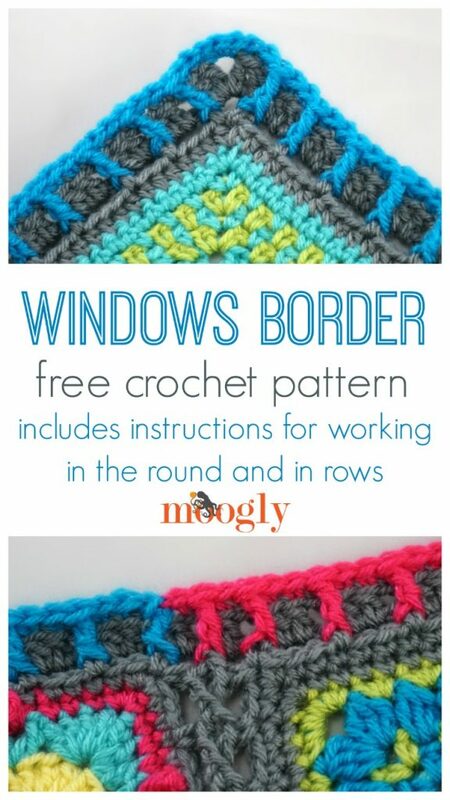 That’s it for the Windows Border! 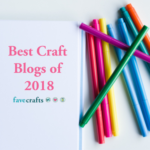 The instructions are pretty generic because you can add borders to all sorts of projects – and often have to do a little “fudging” to make them work since stitch counts don’t always match up just so. You can see in the photo above how I got creative in the spaces where the squares were joined, working just one dc in the ch loops that were joined together at the corners. Feel free to play with this pattern, adjust and improvise to make it work! 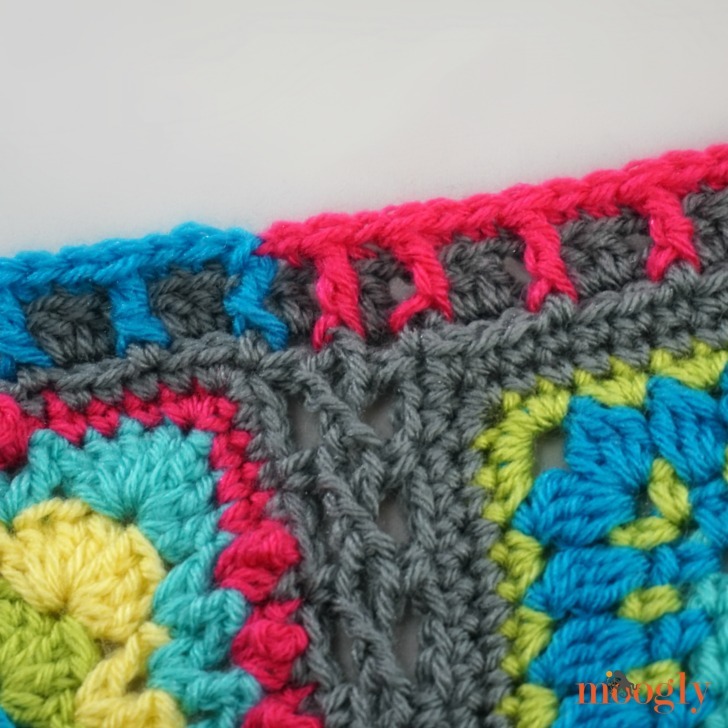 I love the way this border calls back to the colors of the blanket by using multiple colors for Round 2 of the border. 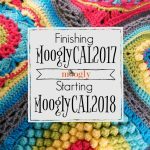 It was a lot of fun to finish off my MooglyCAL2017 blanket, remembering all the wonderful patterns and designers involved. For more info on the CAL, please CLICK HERE! I realy like the border. 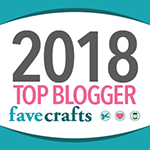 Even though I didn’t do the 2017 CAL ( I am ashamed to admit I still need to finish 2016!) 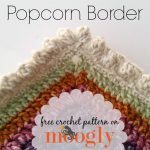 I am going to file this border pattern away to use on a project sometime! Hi would it be possible to obtain just the pattern for the Greyson Blankie? I have some LBY I bought last year and love the way it looks in the photo. Looks fairly easy! Just my style. JUST TO WISH YOU A VERY MERRY CHRISTMAS. I TRY TO READ EVERYTHING YOU POST. ♥ Thank you so much Judie! Merry Christmas and Happy New Year! Very nice border! It really ties the different squares together but still adds some interest on it’s own too. Love it! 😀 Thanks so much Pia! 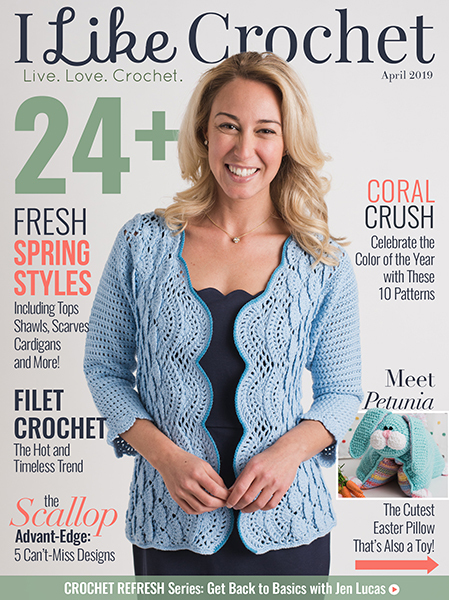 Tamara: I am amazed at the amount of free patterns and advice you give out. Your generosity is so much appreciated and admired. I don’t mean to sound cheap, but I get so tired of getting newsletters and blogs from people, containing nothing but things they want to sell. I know people put in lots of time on instructions and patterns, but occasionally it wouldn’t hurt for a freebie of some sort. You are an exception in many ways and I for one appreciate your help. Thanks so much. ♥ Thank you so much Pat! Have a wonderful week! Just used the Windows border on a small stash buster blanket and love the results. Thanks for all you do for us. I’ll send you a pic of the final product after it comes out of the dryer. 😀 I’m so glad you like it! Thank you Pat!